The western outskirts of Hamburg, Germany. Latitude 53 north, roughly the same parallel as Edmonton, Alberta. The air is chill and coarse. 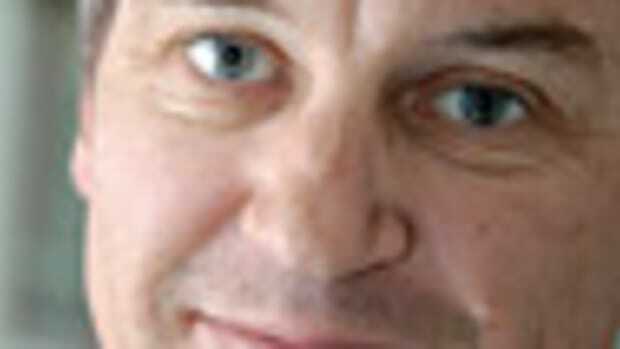 A brisk westerly reddens cheeks but can’t wipe the smiles from Jenny Felshart’s and Mareike Schiffler’s faces. The sisters had invited me to visit a good old friend of theirs: Ronja, a 20-foot carvel-planked wooden dinghy with a small, cozy cabin and basic interior. She was built in 1936, and the sisters have owned her since 1999. The name was their idea, inspired by the adventurous protagonist in Astrid Lindgren’s children’s book Ronja Rövardotter, known in English as Ronia, the Robber’s Daughter. They proudly posed for a photo, but the occasion also had a tinge of bittersweetness, as their darling and one-time ticket to adventure is now in retirement. She’s parked in a covered carport, slowly getting long in the tooth because her owners are busy with worldly affairs, holding down jobs and raising families. They still sail but on larger, faster and more comfortable boats that accommodate the whole family. It’s a common story that plays out around the world: Shifting interests threaten to force the sale of the jalopy. 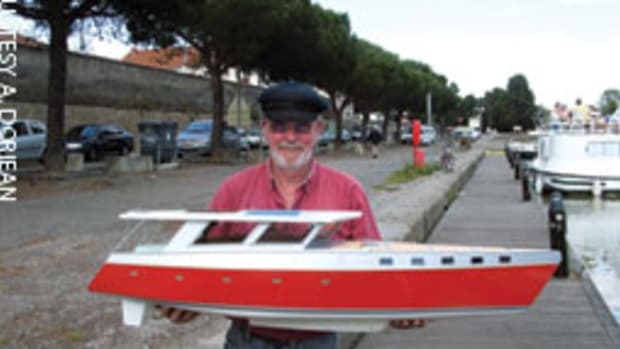 However, in Europe’s ludicrously overstocked used-boat market, old boats, even those in serviceable condition, now often are given to charities or are unceremoniously broken up for lack of takers. Luckily, Ronja will be spared the wrecking ball because to Jenny and Mareike she will always be special. They bought the boat in deplorable condition in 1999 with money their parents had saved for them, a grand total of 2,500 German marks (about $2,000 today). Jenny was 19 and Mareike 17, and that was a lot of dough for two teenagers, but it was only the beginning, as they would soon find out. They were expert cruisers because many kids around here cut their teeth aboard youth cutters. 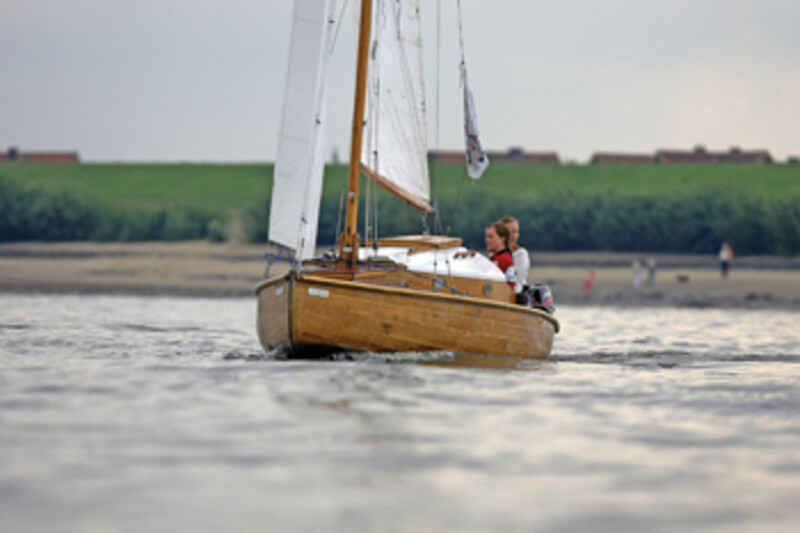 Operated by local clubs, the cutters are crewed by youngsters, who learn the law of the sea and, naturally, get to spend time away from boring parents. “It was fun, but there was a point when we’d had our fill of cutter sailing,” Jenny says. They were smitten with that little vessel despite her shortcomings. 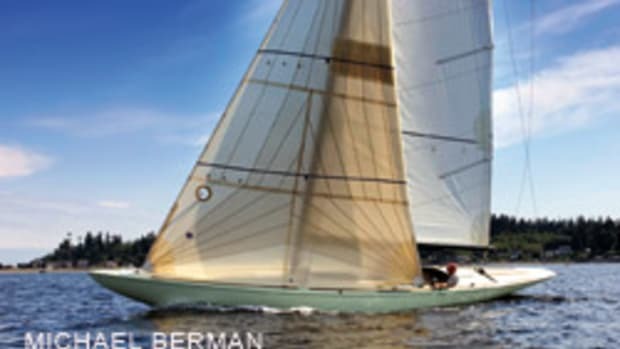 Her first owner in Berlin deliberately sank her to keep her out of harm’s way during World War II. Alas, he did a lousy job, packing insufficient ballast into her bilge, so she resurfaced partially, which exposed her wood to air and later hastened rot. When Jenny and Mareike took possession, they had no idea how to restore a leaky, creaky wreck. But how hard could it be? What you don’t know can’t hurt you, right? With youthful ambition they rolled up their sleeves and set to work. “We thought we’d be back on the water sailing the following year,” Mareike laughs. It was one of those delusions that get sorted out over time and not without pain. They launched Ronja as planned in 2002. Their first trip took them down the Elbe River from Hamburg and through the North Sea-Baltic Sea Canal to Kiel. Enthusiasm gave way to dismay because the crew spent more time bailing than sailing. “People laughed at us,” Jenny says. What followed were five years of hard labor, assisted by friends and family, replacing planks and caulking the gaps that weren’t too big. With heavy hearts, they glassed over the hull to make it watertight and give it structural integrity. Purists consider such an act a sacrilege, but the sisters didn’t have the means for an original refit. And there were more bits and pieces they had to replace: the companionway hatch, the centerboard trunk, the rubrail — and always varnish, varnish, varnish. It was a marathon, and at times they wanted to just throw in the towel because it was all toil and not much fun, especially not the kind of fun they envisaged, making remote shores under sail on their own. But they were tenacious and received encouragement. Word got out in the sailing community about these two young women fixing up an old jalopy. And there were eager lads offering a hand and advice to help the sisters fulfill their dreams, sometimes also in (vain) hope of blazing a path to their hearts. 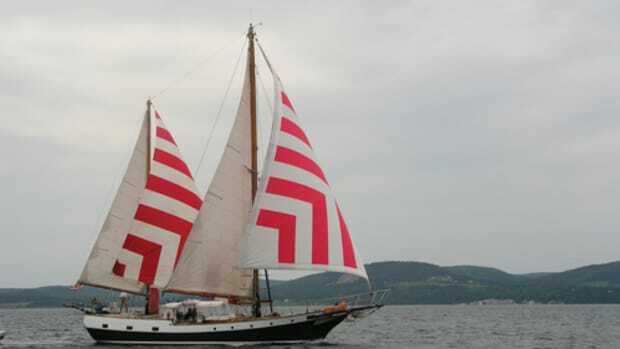 Ronja’s relaunch in 2005 was accompanied by a concert of honking horns at the marina. The fact that the little yacht was floating high while staying dry inside seemed surreal after all Jenny and Mareike had been through. “There were times when we didn’t think this would ever happen,” Mareike says. “Liberating” is how her sister describes the emotions of that moment. They could finally enjoy the fruit of their labor instead of scheduling another grunt session at the yard or dealing with blokes at the hardware store who messed with them because they’re girls. 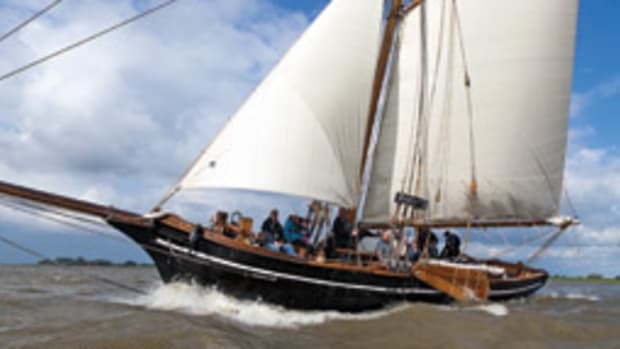 And enjoy they did, sailing Ronja around Hamburg, down the Elbe, to the Baltic Sea and up to Denmark. 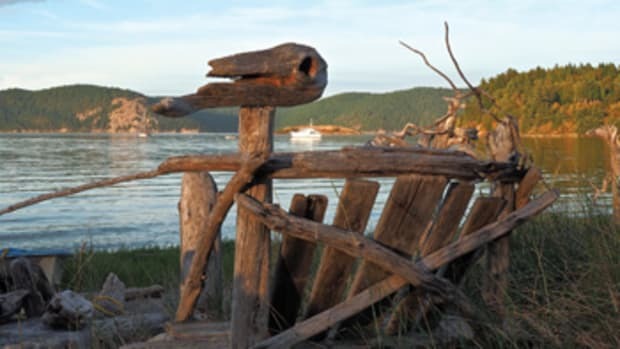 On one of their trips Jenny met her future husband, who at the time sailed a wooden Folkboat. The women affectionately call their little yacht “patchwork” or “humpback whale” because Ronja might be pretty, but perfect she is not. Over the years several types of wood were used, including oak, pine and plywood, which give her a unique look. She also has plenty of personality. “Wherever she likes it, she gets stuck,” Jenny says with a laugh. “Especially, those red channel markers seem to be her favorites.” Ronja wears the scars and bumps of time with pride, aging with grace. Yet this tale is a coin with two sides because the boat didn’t just receive a lot of TLC — she also gave back to her owners. “The restoration project taught me perseverance and gave me the confidence to tackle big issues,” says Jenny, who is raising 11- and 13-year-old girls who are foster children. Of course, this presents an entirely different set of challenges, but it also requires the qualities Jenny developed in those hot and sticky days covered in dust, planing Ronja’s planks until she had blisters on her hands. Being snubbed at the dock by people with bigger and flashier boats, or shrugging off comments about Ronja’s un-yachty appearance, she and Mareike learned how to keep cool. “The boat taught us patience and poise,” says Mareike, “and to stop stressing if you can’t check off all the items on your to-do list.” That kind of Zen led her to another relic, a 1987 Volkswagen bus. It’s a mundane hippie van that she slightly pimped with a fat stereo but otherwise kept as a simple camper, with basic accommodations in the back and her son Lars upfront, strapped into his safety seat and enjoying every second. 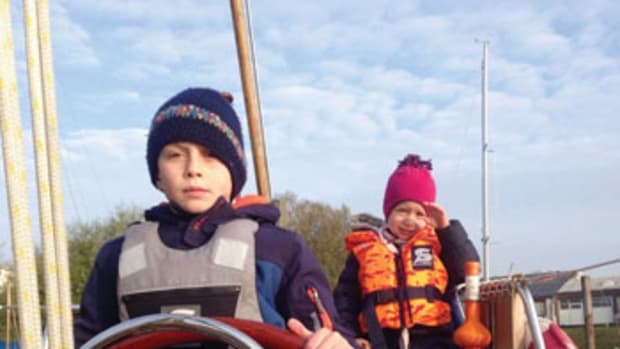 Of course, they’d like to rejuvenate Ronja to celebrate her 80th birthday, but also to take their kids for a spin, starting the ritual of passing the torch to the next generation so they, too, might learn important lessons from this little yacht. She needs a new rudder, a bit of sanding, varnish — chicken feed, really, compared to the work the sisters put into her. Yet the real reasons they have to come back to Ronja are simple: the musty smell of damp, old wood, the quiet gurgle of wavelets lapping against the hull, the silence of a mild summer evening, the slow sail home in the long hours of dusk at latitude 53 north.